What's the best part of boating? Getting out on the Lake! Our Members have enjoyed more boats and had more fun while paying less money than if they had purchased their own new boat. When Boat Club Members arrive at the marina, their boat is ready and waiting fueled up and stocked with all of their requested water toys! They climb in and take off! The club owns the boats and pays the slip rent, licensing, maintenance, and boat insurance expenses, PLUS boats are regularly replaced with new boats. 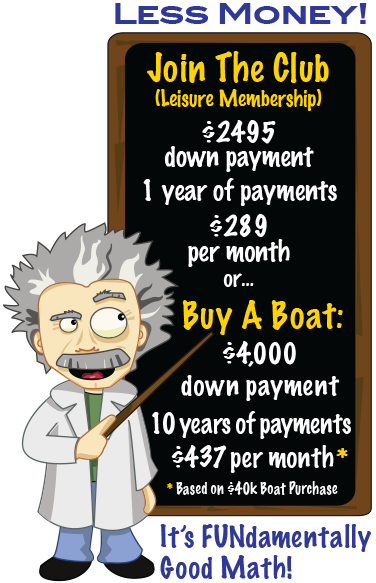 Beginning Boater or Previous Boat Owner…The Boat Club can get you on the lake! 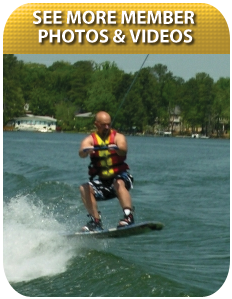 Whether you are a beginning boater or previous boat owner, the Boat Club can Get You on the Lake. For beginning boaters, we teach you how to properly and safely operate a powerboat. All members get personalized boating instruction on the water. Our goal is to make “Mom and Dad” comfortable operating the boat. We help you cast off and assist with docking when you return. You will have unlimited opportunities to enjoy the wide variety of boats in our fleet. Additionally, if you decide to try boat ownership in the future, our "Peace of Mind" refund will provide cash towards the purchase of your new boat. For previous boat owners who gave up the fun of boating due to the cost and the hassle, our Valet Boating Service is the most affordable, convenient and hassle free way you will ever go boating! Ask about our variety of membership levels including Platinum, Gold and Leisure with options for corporate and shared memberships with family and friends – all with unlimited use. Reciprocal guest privileges at other Nautical Boat Clubs. Lake Murray Marina and Yacht Club: All of the privileges of slip holders at Lake Murray Marina & Yacht Club including a fully stocked ship store. Better Boating: Access to kayak, standup paddleboard, and pedal boat rentals. Liberty on the Lake: Special service, great food & drink, and beautiful sunsets at the new restaurant, Liberty on The Lake. The Peninsula at SouthShore Marina: Complimentary use of kayaks and standup paddleboards plus adirondack chairs, picnic tables, and kayaks.